The Church of England has declared its support for a challenging proposal to tackle the threat of climate change. 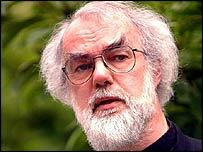 The Archbishop of Canterbury, Dr Rowan Williams, says the plan, known often as "contraction and convergence", offers a way to act justly towards the poorest. 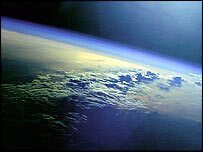 The idea, hatched by the Global Commons Institute, says all the Earth's people have equal rights to cause pollution. Already endorsed by other faith groups, it says nobody, however rich, should cause more than their allotted share. "Contraction" means cutting the world's output of the gases (like carbon dioxide) which scientists believe are threatening to heat the atmosphere to dangerous levels. "Convergence" means sharing out between countries the amount of climate pollution which the scientists say the Earth can tolerate, so that by perhaps 2050 every person in the world is entitled to emit the same amount of pollution. The idea has won the backing not only of religious groups like the World Council of Churches but also of the chairman of the UK's Royal Commission on Environmental Pollution and of Sir John Houghton, an eminent climate scientist. Now the leader of the worldwide Anglican Communion, Dr Williams, has added his voice to the growing chorus of support for the work of the modest London-based Global Commons Institute. In a lecture in London, entitled Changing The Myths We Live By, he said we had to avert a global ecological crisis that could ultimately jeopardise "our viability as a species". The archbishop criticised specifically "the addiction to fossil fuel of the wealthy nations; this is what secures the steady continuance of carbon emissions, but it is also what drives anxieties about political hegemony". He said: "Since the oil production of relatively stable and prosperous societies is fast diminishing, these countries will become more and more dependent on the production of poorer and less stable nations. "How supplies are to be secured at existing levels becomes a grave political and moral question for the wealthier states, and a real destabiliser of international relations. "This is a situation with all the ingredients for the most vicious kinds of global conflict - conflict now ever more likely to be intensified by the tensions around religious and cultural questions." What was also at stake, Dr Williams said, was "our continuance as a species capable of some vision of universal justice". He feared "the prospect of a world of spiralling inequality and a culture that has learned again to assume what Christianity has struggled to persuade humanity against since its beginning - that most human beings are essentially dispensable, born to die". Contraction and convergence, the archbishop said, sought to achieve fairly rapid and substantial reductions in greenhouse gas emissions "in a way that foregrounds questions of equity between rich and poor nations". He said: "This kind of thinking appears utopian only if we refuse to contemplate the alternatives honestly." Calling for a new sense of public seriousness about environmental issues, Dr Williams urged the UK government to take the lead in pressing the contraction and convergence agenda.